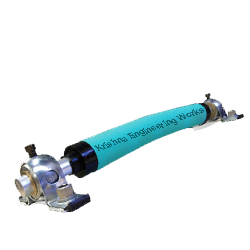 Krishna Engineering Works have been successfully manufacturing, exporting & supplying all types of Rubber Roller, Textile Rubber Roller, Industrial Rubber Roller. Welcome to Rubber Rolls India, has established from last 25 years. Specialized in manufacturing all types of Rubber Rollers. Also, manufacturer of Machinery for Flexible Packaging, Paper, Tire–Cord, Textile Machinery & Equipment since last 25 years from Ahmedabad, India. Rubber Rolls India, a leading and genuine manufacturer of Rubber Roller with high quality Rubber for different industries and machines. We are winner of 3 times National Award and 2 times International Award for Quality manufacturing. We are ISO 9001:2008 Certified Company. Rubber Rolls India, manufacturer of all types of Rubber Roller, Ebonite Rolls, Guide Rolls, Brush Roller, Super Hard Rubber Roller, Coated Roller. Also, Inflatable Rubber Tube, Pinch Roll, Printing Roller, Grooved Roll, Impression Roller, PU Roll, Silicon Roll, Regrinding, Recovering, Recoating of Rubber Roller, with Repairs & Servicing, Rubber Fillet, Bow Roll, Metal Roller, Air Shaft, etc… We have been manufacturing for different industries like textile, flexible packaging, paper and many more. Rubber Rolls India, a leading manufacturer of Industrial Roller, Printing Rubber Roller, Precision Rubber Roller, Polyurethane Roll, Knurling Roller, Convey Roller, Grooving Rubber Roll, Hard-chrome Plated Roller. All our Rubber Roller designed with high quality, durability and including performance meets the need per client. Also, Rubber Rollers are widely attached in Flexible Packaging, Paper and Textile Industries. Specialized for different machines like Stentor Machine, Rotary Machine, Jigger machine. Rubber Roller with accurate dimension for different polymer per client’s requirement and different applications. Rubber Roller for different process like Lamination, Slitting, Printing, Cutting Sealing, Flexo Graphic Printing with excellent surface finish to meet international standards. Our skilled engineers understands proper technology for effective printing method per your machines. We have been providing the right technology, material and covering that enables the creation of the exactly required packaging. 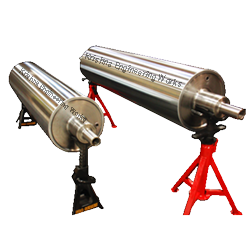 Heavy duty and high performance grade rollers on custom requirement. 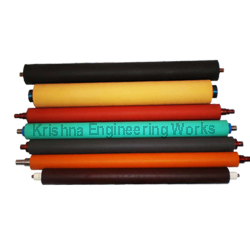 Rubber rolls for different industry specific Generally in Textile Industry Roller featuring with chemical resistance and preciseness. All our Rubber Roller, Industrial Rollers and Bow Roll also standard product range and are always in stock. Also, manufacture custom Rubber Roller per your application and requirement. High quality and speed are the most important to reach client’s requirement by industry specific. Within one year of expansion, the company has already received “INTERNATIONAL QUALITY EXCELLENCE AWARD”, “BHARATIYA UYDOG RATAN AWARD” & “INDIAN ACHIEVERS FOR INDUSTRIAL DEVELOPMENT AWARD”. These Awards & recommendations are recognition of our hard work to strive for International success by providing International Quality.